600 pages | 75 B/W Illus. The lingo of soil science is a language unto itself. 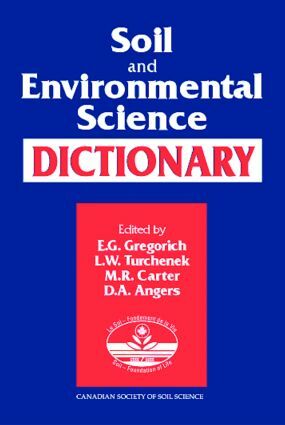 Soil and Environmental Science Dictionary is a glossary of terms used in soil and environmental science, including terms from related disciplines. Designed for teachers, students, researchers and others interested or involved in environmental sciences related to soils, this compilation includes all terms and definitions from the current Canadian Society of Soil Science (CSSS) glossary as well as from various other sources such as the Soil Science Society of America and the Soil and Water Conservation Society. Soil and Environmental Science Dictionary defines terms accurately and clearly for professionals working in areas such as agronomy, building construction, civil engineering, forestry, environmental science and planning, geology, hydrology, petrology, and plant science. "…I therefore congratulate the editors of the Soil and Environmental Science Dictionary for compiling this valuable reference tool, which I am sure will find favor with many who work in the greater soil and environmental sciences field…This dictionary should serve as a valuable reference for anyone who deals with multi-disciplinary soil and environmental issues: scientists, students, teachers, environmental manager, regulators, consultants, and policymakers." "The title of this dictionary implies that it is mainly concerned with soil and environmental science, but it covers a broader range of disciplines, including physical geography, geology, and meteorology. Readers needing brief but informative definitions will find it very helpful…it is published in English and French, making it useful for the discipline for which it was designed as well as for language classes…Highly recommended for all libraries and all levels of users."